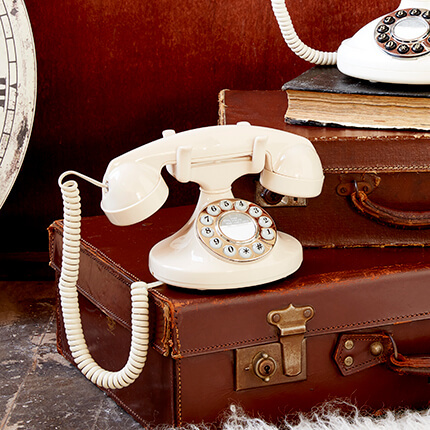 The GPO 746 Push Button Telephone is one of the most popular telephones ever designed. 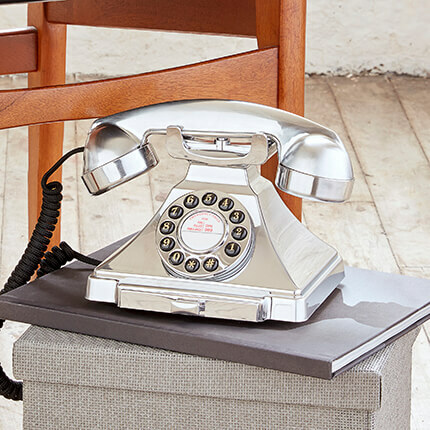 A slice of British history, this telephone features an authentic bell ring with easy-to-use, push-button dialing. The GPO 746 Wallphone is easily fixed to the wall and is the ideal addition to any home or business. There’s even an extralong handset curly cord so you can circle the room while you talk. 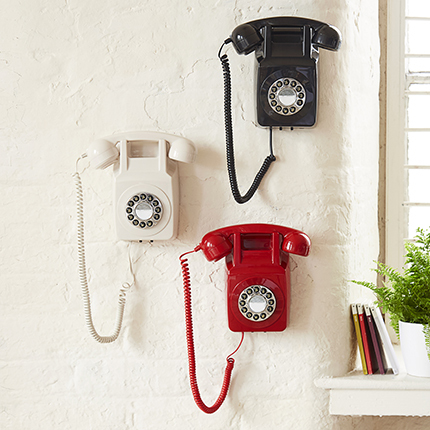 The GPO Carrington Landline Phones / Corded Phones is a suave but contemporary, classic design. 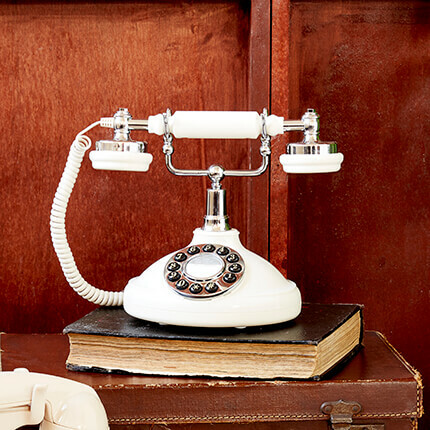 This British telephone has just the right amount of 1920s decor, combined with modern technology. 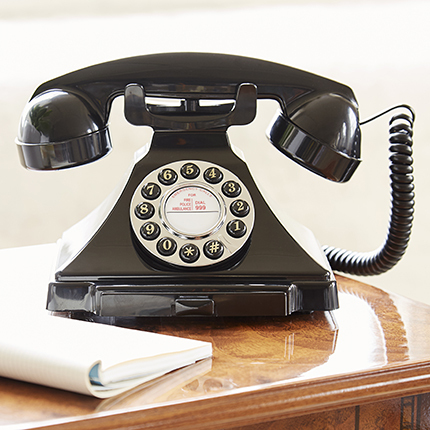 The design is based on the vintage Bakelite telephone and features push-button dialling, a pull-out pad tray (originally used for keeping notes of exchange numbers) and authentic bell ring. The GPO Duchess is regal with a classic shape and design. 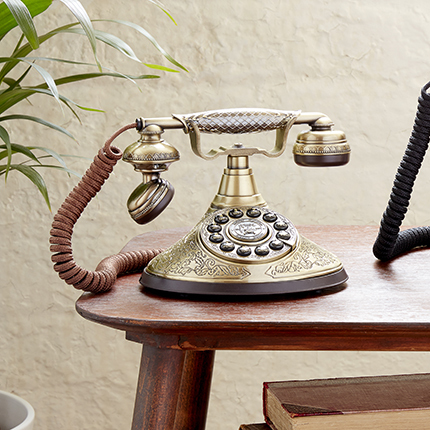 Lovingly designed (in-house) by GPO, the Duchess has a solid, brass finish and traditional cloth handset curly cord. The GPO Duke, an early 20th-century design, is a stylish addition to any living space. 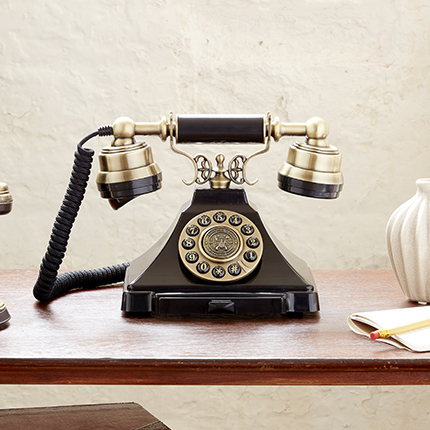 The Duke has traditional features such as a pull-out note tray, solid high-quality finish and handset curly cord. The GPO Opal are chic stylish designs fitted with modern technology and they’re compatible with all standard analogue telephone lines. The GPO Pearl Landline Phones / Corded Phones are chic stylish designs fitted with modern technology and they’re compatible with all standard analogue telephone lines. There’s nothing better than a retro classic walking hand-in-hand with cutting-edge design. 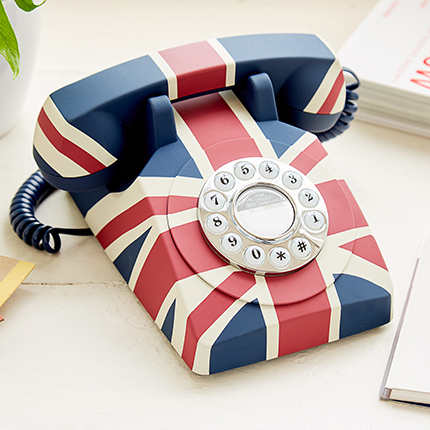 Featuring the regal Union Flag, this fully functioning telephone comes in a stunning, rubberised finish and is ready to plug and play.